This is Woodworking Safety Day (formerly Woodworking Safety Week). It is also National Nurse Appreciation Week (I really hope that was pure coincidence! ), Senior Corps Week, National Teacher Appreciation Week, International Compost Awareness Week (really? ), and National Travel and Tourism Week. Regardless the competition, if the heightened awareness brought about by Woodworking Safety Day saves one finger or one eye it is worth all the ink and every keystroke on every blog, in every magazine, and on every woodworking club agenda. The coverage of accidents and how to avoid them will likely be intense this week. But I have lately become equally interested in accidents that occur not with a shriek, a bang, or a buzz, but those that occur over a protracted period of time… the injuries that sneak up, like a thief in the night, and can rob us of health and vitality. I am talking about long-term exposure. In this column I have previously addressed noise and dust, two primary long-term exposure culprits. 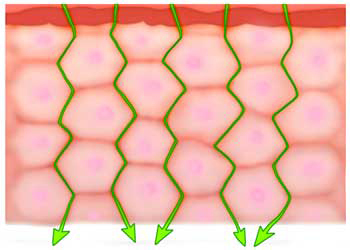 For this particular week of focus on safety, I want to address skin exposure. Somewhere along the way the skin’s ability to absorb pharmaceuticals and chemicals entered the collective consciousness. It was something we really did not think much about before, but an onslaught of advertisements for stop-smoking patches, birth control patches, localized pain relief patches, testosterone-boosting patches, and even those miracle footpads that were touted as able to remove toxins from our body, all contributed to our collective realization that our skin, our largest organ, is capable of, and in fact very efficient at, pulling chemicals (both good and bad) into our bodies and into our bloodstream. As this awareness has grown, some obvious marketing opportunities have been seized. Makers of lotions, potions and makeup have begun touting their more-natural or all-natural ingredients. 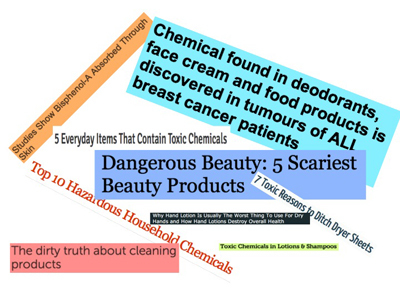 Magazines warned us of parabens in our deodorant, lead in lipstick, sulfates in our toothpaste, and petroleum-based products in our hand cream. Fluoride, frequently the subject of grand conspiracy theories, hit the headlines again and the use of artificial colorings and sweeteners is being questioned; all-natural alternatives have begun to crowd the store shelves. But this is not merely marketing hype, and we woodworkers would be well advised to pay attention to the things that might be killing us slowly in addition to those things that could hurt us quickly. Funny, but like most of Carlin’s comedy, it is funny because there is a hint of truth. Our body is a complicated machine that burns fuel, expels waste, filters impurities, sifts between the necessary and unnecessary compounds, and occasionally does a little woodworking. When we woodworkers dip a rag in solvent to wipe something, use our bare fingers to spread some oil, grease, putty, or solvent-based wood filler, or when we use harsh cleaners to scrub pitch from a saw blade, we do not get an immediate warning signal of pending danger. Instead, we may get a long-term cumulative impact that, like the thief in the night, sneaks up on us and intends us harm. 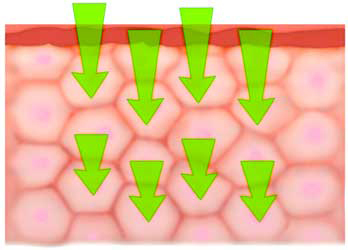 So, while others address the slam-bang-crash side of safety, please give some thought to the long-term impact of dermal contact exposure. Wear gloves when handling chemicals and cleaners, read the label on that cream you slather on your chapped hands, and watch out for the fluoride… it really is a subversive plot! 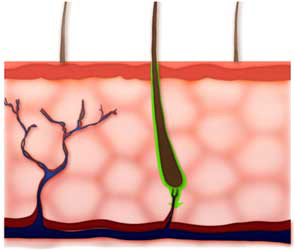 Skin pathway illustrations from the Center for Disease Control. For more information, or to research the potential toxicity of chemicals in the products you use, consult the web sites of OSHA, the CDC, and download this document prepared by North Carolina Statue University. These are good starting points. Excellent post, thanks. Part of our routine should necessarily be using nitrile gloves throughout the working day. A great heads up. Years ago a friend, who is much more into science than myself, let me know that Acetone travels so quickly that if you get it on your hands and immediately wash it off, it has still had time to enter your central nervous system. I try to keep my hazmat to a minimum, as I just don’t want to add anything else into the mix of how I abuse my body. I’ve only got so much liver function and it’s already been reserved for alcohol! I’m laughing because… well, I wish I had thought of that!!! I’m trying to reserve my liver function, too!